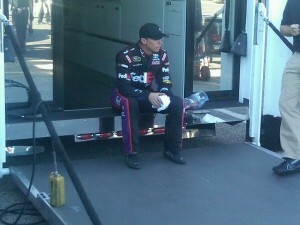 Denny faced a very tough day at the 2.66 mile Talladega track, where it’s not how good you are, but how lucky you are. Denny was working hard early in the race to hang back and not push the issue. Hamlin was simply trying to stay out of the “Big One”. Unfortunately Denny hung back a little to far and lost the draft. Denny ended up going a lap down and hung on to try and get the Lucky Dog. A round of green flag stops came and Denny lost the lucky dog position to Ryan Newman. A yellow finally came out and Denny wasn’t able to get his lap back. During the Yellow Flag pit stops Denny and his crew chief were arguing about whether should stay out, gain his lap back and wait for a yellow, or if Denny should stay a lap down, come pit and get the lucky dog later. Fortunately both calls would have worked out, Denny pitted stayed a lap down, and the next caution, he barely got the lucky dog position. Denny raced hard from here on out, and with the help of his teammate Kyle Busch, they soared to the front. Unfortunately they wouldn’t be able to hold onto the top 2 spots and fell back. On the final restart Denny made his way up to seventh, had Mark Martin pushing him, and Jimmy Johnson and Jeff Gordon on his side. Mark Martin quit pushing Denny leaving him all on his own, Jimmy then violently threw the car down below Denny to get in front of Mark Martin. Denny was left with NO drafting help, luckily the caution that brought the race to a Checkered Flag finish, kept Denny from falling back any further. It could have been much worse, but Denny came home with a solid 9th place finish, and Jimmy Johnson came home with 7th. Denny is now 14 points behind Jimmy Johnson.